These pictures are somewhat random, but I don't seem to find the time to blog as often as I want. First, on the 4th of July, Dan and I walked with Mckenna and Gabriel about a mile to a parking lot where we had parked our car earlier. 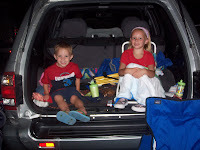 The kids sat in the back of the car and watched the fireworks display. Gabe only lasted a few fireworks--he said he liked the noise, and he liked the lights, but not at the same time. Mckenna, of course, loved every second. We took care of baby Morgan for 2 nights last week while her daddy spoke at a conference. She is a precious, sweet little 6 month old, a joy, truly. Juliana was not sure what to make of her. She was very interested, but is not famous for being gentle, so we kept a close eye on her. 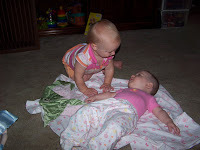 Morgan thought Jules was sheer entertainment, and would roll and scoot to get a good view of her. 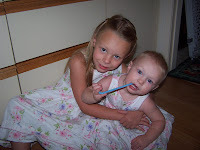 My two girls--aren't they adorable? Mckenna is such a girl, in some ways. She is adamant that she must wear a dress to church each Sunday--not a skirt and shirt, but a dress. This week she picked out her Easter dress, and wanted Jules to wear her's as well. It is a joy when I can let her have her way, because there are plenty of times I must say no. So, they wore their matching dresses. As you can hopefully see, Mckenna's lip is much better. She has her final appointment on Tuesday morning, where I am expecting the doctor to declare her fully healed! Carlee, those are fun pictures! Thank you for you comment. I have been thinking and praying about you. Lately God has put you on my heart. Lets get together for another swim day.